Two such moments occurred yesterday. The first occurred somewhere in the middle bites of a heap of pulled pork slathered with jalapeño sauce at Bubba’s Bar-B-Q in Jackson. The second occurred last night while fire roasting, and subsequently eating, a pound of kielbasa. Add a few hours of hiking with a heavy pack, some overnight settling time, and a cup of morning coffee and you have what some call a perfect storm that involves only your inner being, a conversation with God with promises that you’ll eat better, and a trowel. It’s best that these moments occur far away from camp and the trail in a well concealed woodsy location. We slept in until 7:30 AM this morning after getting to camp late and to bed after midnight last night. Having 7 hours of rest felt good after the typical lead-up to any big trip, which involves a lot of last minute preparation and tying up loose ends, which invariably results in a bit of sleep deprivation. We awoke to a warm and sunny morning and enjoyed leisurely breakfast before saddling up our big packs for a moderately challenging day as we continued heading towards the Continental Divide. We took our first big break after four miles at Monument Creek, where I couldn’t resist the urge to string up a Tenkara Sato and tie into to three pan-sized brook trout on a Parachute Adams. The last half of the day involved a couple of steep but short climbs, and we arrived in camp in the late afternoon. A combination of hiking at altitude (we will now remain above 10,000′ for the next 8.5 days), about 1,500′ of cumulative elevation gain, and toting big packs for nearly 9 miles made us eager to reach our camp in the Bald Mountain Basin. Today’s effort started to reveal the fruits of our training for the past several months – as well as the fatigue of those who perhaps didn’t train as much as they wanted to. 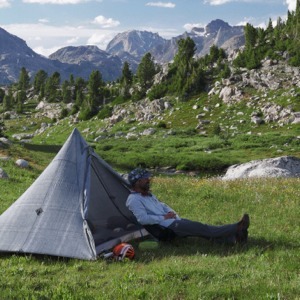 The Wind River Range is high, rugged, and wild, and we don’t take its wildness for granted. In Bald Mountain Basin this evening, we encountered a NOLS group that took six hours to travel six miles today (off-trail, along our route planned for tomorrow). We are camped at Spider Lake on a soft tundra bench overlooking the lake’s southern shoreline. Our camp is framed by three big granite peaks that loom large and close immediately east of us – we are now in the shadow of the Continental Divide. To our north lies the jagged peaks, ice couloirs, and thousand foot cliff faces of the Fremont Massif. It’s a five-star location. Except that we are a bit exposed. The trees are pretty little here. As evening wore on, yesterday’s cirrus warnings once again proved reliable, with a cold front appearing to be coming in from the north. Ominous looking nimbus, an increasingly strong breeze, falling temperatures, and massive bolts of lightning striking the summit of Fremont Peak motivated me to relocate my shelter into a lower grove for more wind protection. Our group of 11 is camped in five pyramid shelters – three Hyperlite Mountain Gear UltaMid 4’s, one Mountain Laurel Designs SpeedMid, and my little Locus Gear Cuben Khufu. They are rigged with lots of guylines and 12 to 16 stakes each. They remain our choice for mountain travel and we’ve weathered everything Montana and Wyoming have thrown at us since we started using miss in 2010 for our group trips. Our group is now starting to normalize, settling into their routines. It always takes a few days! Morale is pretty good, fueled in part by the fact that we ate fried food tonight – pizzadillas fried in ghee on our fry bakes. Weather permitting, we are planning an early start tomorrow, and a route progressing north along the high benches flanking the eastern slopes of the Continental Divide. We hope to make it to the northern end of Wall Lake.